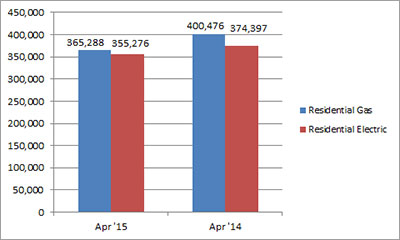 U.S. shipments of residential gas storage water heaters for April 2015 decreased 8.8 percent, to 365,288 units, down from 400,476 units shipped in April 2014. Residential electric storage water heater shipments decreased 5.1 percent in April 2015, to 355,276 units, down from 374,397 units shipped in April 2014. For the year-to-date, U.S. shipments of residential gas storage water heaters increased 5.2 percent, to 1,644,263, compared to 1,563,455 units shipped during the same period in 2014. 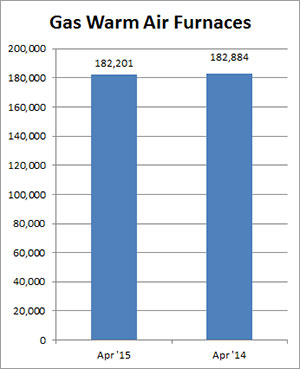 Residential electric storage water heater shipments increased 11.8 percent year-to-date, to 1,645,331 units, compared to 1,472,050 units shipped during the same period in 2014. Commercial gas storage water heater shipments increased 22.7 percent in April 2015, to 10,858 units, up from 8,852 units shipped in April 2014. 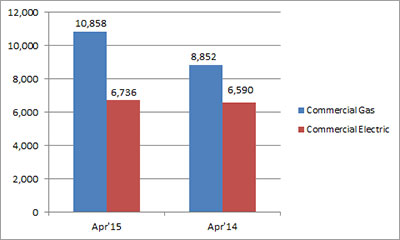 Commercial electric storage water heater shipments increased 2.2 percent in April 2015, to 6,736 units, up from 6,590 units shipped in April 2014. Year-to-date U.S. shipments of commercial gas storage water heaters increased 15.3 percent, to 38,678 units, compared with 33,557 units shipped during the same period in 2014. Year-to-date commercial electric storage water heater shipments increased 15.1 percent to 28,461 units, up from 24,735 units shipped during the same period in 2014. 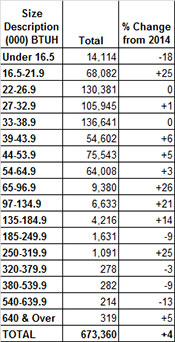 U.S. shipments of gas warm air furnaces for April 2015 decreased 0.4 percent, to 182,201 units, down from 182,884 units shipped in April 2014. 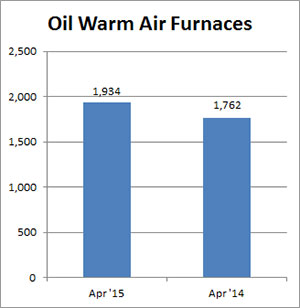 Oil warm air furnace shipments increased 9.8 percent, to 1,934 units in April 2015, up from 1,762 units shipped in April 2014. Year-to-date U.S. shipments of gas warm air furnaces decreased 0.3 percent, to 780,688 units, compared with 783,351 units shipped during the same period in 2014. Year-to-date U.S. shipments of oil warm air furnaces increased 12.4 percent to 10,508, compared with 9,347 units shipped during the same period in 2014. 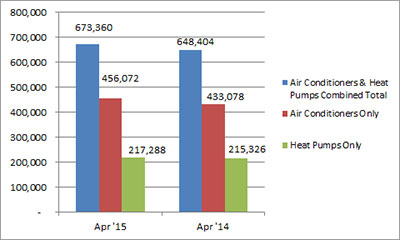 U.S. shipments of central air conditioners and air-source heat pumps totaled 673,360 units in April 2015, up 3.8 percent from 648,404 units shipped in April 2014. U.S. shipments of air conditioners increased 5.3 percent, to 456,072 units, up from 433,078 units shipped in April 2014. U.S. shipments of air-source heat pumps increased 0.9 percent, to 217,288 units, up from 215,326 units shipped in April 2014. Year-to-date combined shipments of central air conditioners and air-source heat pumps increased 12.2 percent, to 2,304,780 units, up from 2,054,421 units shipped in April 2014. Year-to-date shipments of central air conditioners increased 13.2 percent, to 1,477,251 units, up from 1,304,904 units shipped during the same period in 2014. The year-to-date total for heat pump shipments increased 10.4 percent, to 827,529 units, up from 749,517 units shipped during the same period in 2014.